Hearthstone players were greeted with a new Legendary minion following Monday's 9.4 update. 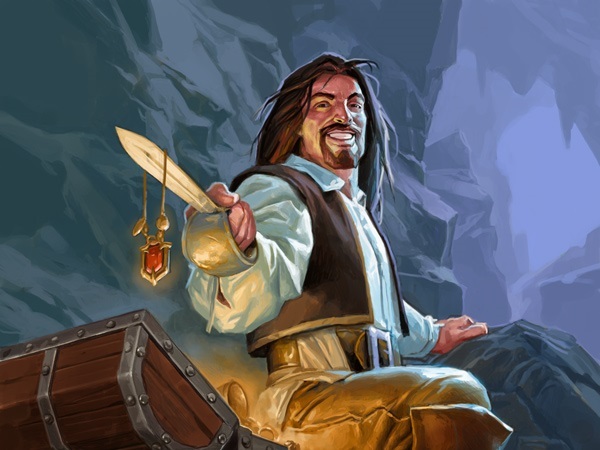 Shacknews takes a look at Marin the Fox and what players need to know about this handsome treasure hunter before taking him out on the board. 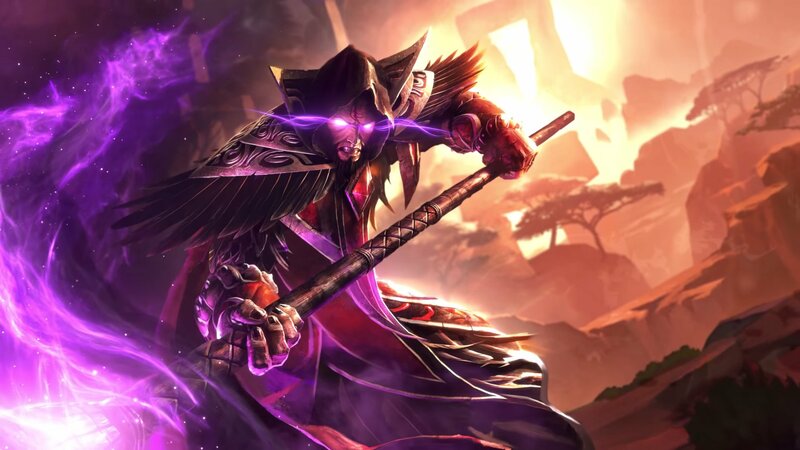 Hearthstone has updated to version 9.4 today. That means pre-orders for the upcoming Kobolds & Catacombs expansion are now open. 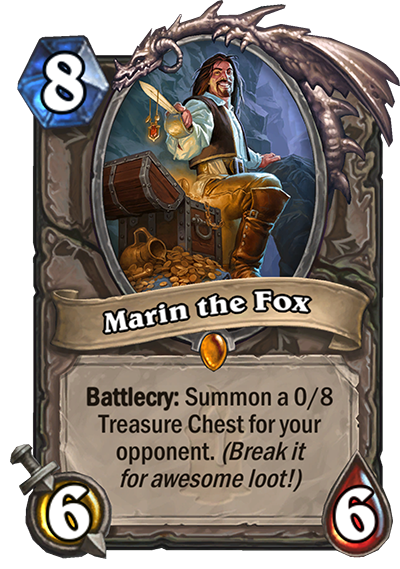 For many more players, that means there's a copy of a Marin the Fox Legendary minion now available for their collection. 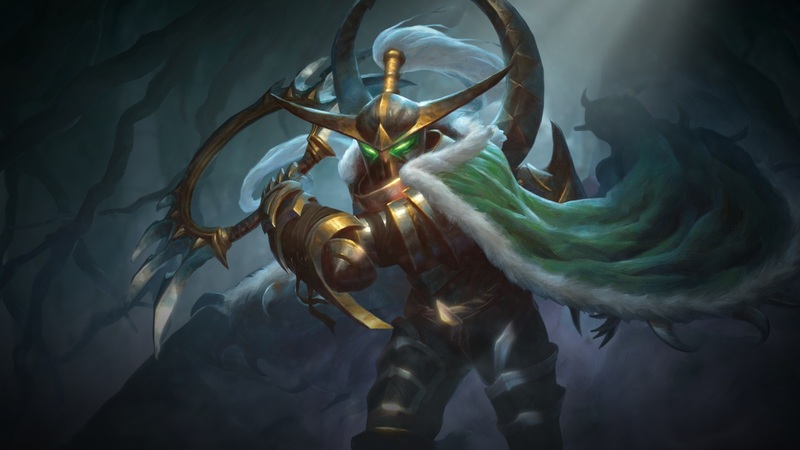 The suave swordsman is the only element of the new expansion that will be playable until its December release date, so there's a good chance that many Hearthstone players will be taking him out for a spin. That's why Shacknews is here to make sure everyone out there plays Marin responsibly. Taunt, Battlecry: Replace your hand with Legendary minions. These are mostly fine options for various stages of the game. Tolin's Goblet is useful for when resources are running low, while Wondrous Wand could draw a crazy board-clearing spell like Ultimate Infestation or Twisting Nether and make it a free play. Golden Kobold is as useful as the number of cards in-hand, because unlike Elise Starseeker and her Golden Monkey, this only targets cards in a player's current hand. Finally, there's Zarog's Crown, which summons two copies of a Legendary minion. This is a roll of the RNG dice, because this card is very likely to come up on three duds. 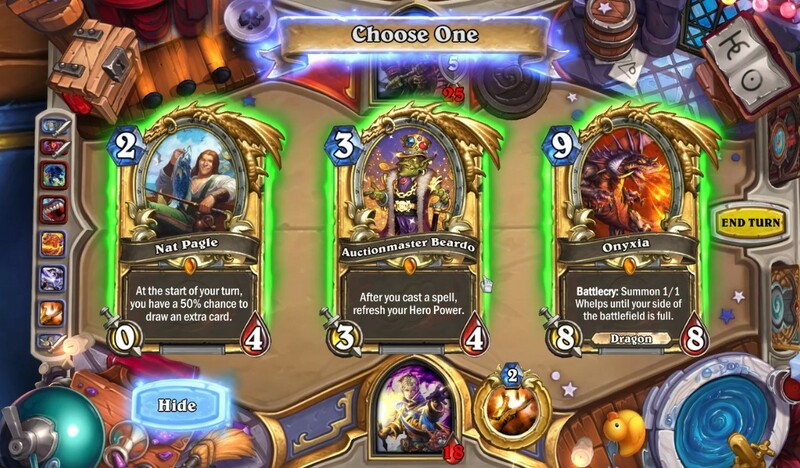 The odds of a solid choice are made much harder when considering that Battlecries are inactive. So players will mainly roll the dice in hopes of a Deathrattle minion, something with an end-of-turn effect, or something with massive stats. One other thing to note about Marin is that it's essential to understand the card text. The Master Chest does NOT work the same way as the Gift Exchange Tavern Brawl. If the Chest is on your side of the board and you decide to break it on your own turn, the reward still goes to your opponent. Do not get sloppy! 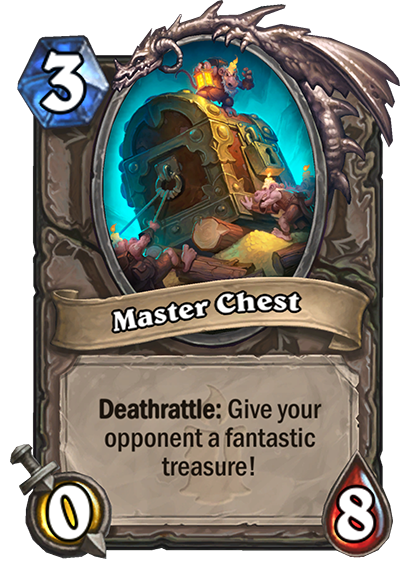 It is fun to note that because the Master Chest is a Deathrattle minion, there's a good chance that if your opponent is packing N'Zoth, the Corruptor, they'll just bring the Master Chest right back for a second round of rewards. There's potential for some cool shenanigans afoot. So what are some of the better cards to play with Marin the Fox? Warrior decks may want to give this a look, since it's fairly easy to dispose of the Chest with Brawl. By that same principle, Mage players may want to keep it around and then break it later with the standard Frost Nova/Doomsayer combo. Ditto for Warlocks that are packing Twisting Nether or DOOM! spells. While those are great options, it's important to consider that while the Master Chest has its own set of rules, it is still fairly simple to counter its play. We'll touch on the counters in just a second, but the safest route for all classes is to not even give the opponent a chance to respond. The easiest way to do this is by packing a Crazed Alchemist or two. The Crazed Alchemist's primary function here will be to break the chest immediately on Turn 10, right after the Marin play. This ensures the loot is ready for the next turn, while also offering up a 6/6 and 2/2 body to ward of the next attack. In terms of single classes, however, the class that's best equipped to take out the Master Chest is Priest. Shadow Word: Horror has become more widely used in the last expansion, especially in conjunction with Pint-Size Potion. Simply play this combo as normal, assuming the opponent hasn't already dealt with the chest himself. An 0/8 Master Chest on your side of the board can be a nuisance, since breaking it on your own turn, as mentioned, will give your opponent the reward they seek. The best thing to do, in this instance, is to take advantage of the fact that the Master Chest is a minion and take advantage of all the rules that apply to it. The Shaman is easily the best equipped to deal with the Master Chest, because of Evolve and Thrall, Deathseer. If the chest is on your side of the board, simply Evolve it into something else. And because the Master Chest is a 3-cost minion, there's a good chance it can be evolved into something that's fairly useful. Rogue is the second class that's adept with dealing with the Master Chest. Because if Marin the Fox hands you lemons, make lemonade, or else you'll catch scurvy or something. Rogue players have been packing a lot of Cobalt Scalebane, as of late. Use this minion's effect or a spell like Cold Blood to up the Master Chest's attack power. If your opponent wants the spoils of the chest, make them earn it by taking out this souped-up box. Finally, there's Priest. Let's just say it's a bad idea to leave an unattended Master Chest with a Priest player. It's not even because of the various Silence spells, either. Remember, one never knows when they'll have a pair of Divine Spirit spells and Inner Fire handy. Get careless around a Priest player and they'll turn the 0/8 Master Chest on their side of the board into a 32/32 one-turn kill. Have you been playing with Marin the Fox so far? What are some of the best combinations and play you've seen from the dashing rogue so far? Join the conversation and let us know in the comments. I might try putting it my big Druid list but I have a feeling it’s going to be dud. I think this is going to be like prince malchezaar where newer players love it but competitive players struggle to make it work.